Now the ONE & ONLY LIVE singing MICHAEL JACKSON TRIBUTE SHOW in AUSTRALIA. Featuring a 6 piece band and vocals, this show can now offer the LIVE authentic concert experience. 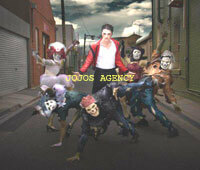 The show is a spell binding dance tribute to the most exciting performer of all time, Michael Jackson. A quality and classy show, which always takes the audience by surprise. An extraordinary show, which will entertain and thrill you until the end. Precise choreographed routines and authentic replica of costumes, makes you believe you are watching MJ himself. State of the Art light show and high quality PA (to suit any venue size). Included in the full production show are special effects eg. LED visual curtain , silhouette screen and the anti-gravity 45º lean as seen in ‘Smooth Criminal’, a recreation of the fan/smoke stage platform Michael used in his live performances, special appearances by Orianthi Panagaris (THIS IS IT) and Rita Hayworth (THIS IS IT) , stage props and an incredible state of the art light show. Choose one of above shows and we can include the live band to also provide your function with a set or two of dance Top 40 covers to get the party started. Dressing Room must be close to stage for fast costume changes. An Australian Aboriginal Contemporary Soul Duo of two beautiful woman and is a tribute to their Indigenous heritage. But there is far more to this very talented duo than just their name. They caught their big break in 2012 delivering a one off show for Noongar Radio’s premiere of the ‘The Sapphires’. They sold out their first band show in 2012 and have been performing non-stop ever since. In 2013 the group was nominated for a Deadly award in the category of ‘Most Promising New Talent In Music’. They have supported some of Australia’s biggest stars including Jessica Mauboy, Nathaniel, Kasey Donovan, Christine Anu, Troy Cassar-Daley and American Grammy Award WInning Artist, Brandy. Building on their already expanding fan base the group released their first single Ready To Love which won Indigenous WAM Song Of The Year in 2015 and took their show on the road to Sydney, Melbourne and soon to Singapore in Sept 2016. Their shows feature some of Motown’s biggest hits performed with glitzy costumes, a gravitas so energetic and a sound so infectious that none can resist their incredible talent. More than just a look-alike impersonator, He will have your guests or delegates clapping, singing and yelling for more as alter ego Elton John. B ringing you the music, costumes, theatrics and humour of one of the world’s most enduring entertainers, as seen through the eyes of a true fan. He has been performing tributes to Sir Elton professionally for over fifteen years, including a guest appearance with the Adelaide Symphony Orchestra in 1996. Close your eyes and you’ll think your hearing the real thing. Special features include:A selection of Elton John’s greatest hits, What if Elton was Australian? Elton meets Karaoke with special guest stars from your audience “By request” segment “Candle in the Wind” with a haunting cello solo Available as a one-man piano/vocal show (with studio backing tracks), or with live backing band according to your requirements and budget.